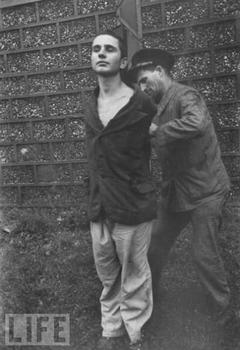 Online now at LIFE magazine's website are disturbing and chilling photographs of the last seven minutes on Earth of six French collaborators, as they are tied to stakes and killed by firing squad in 1944. LIFE photographer Carl Mydans and correspondent John Osborne were the witnesses to the executions in the French Alps. 66 years ago, almost to the day, resistance fighters came together in Grenoble to execute these men who had worked for the Milice, the Vichy police. These pictures first ran in LIFE on October 2, 1944, just one month after they were taken. The slide show is long and feels complete, and shows the men before, during and after their deaths. The photos taken at the moment of fire are blurry from the shock of the shots, and you swear that you see ghosts beside each man. What we don't see much of is the audience, described on LIFE.com by Osbourne: "They might have been hurrying to a circus. They laughed, shouted greetings, raced each other and, at the execution spot, good-naturedly elbowed and jammed each other aside as they struggled for a vantage point."